WASHINGTON — President-elect Donald Trump’s meetings with CEOs seeking federal approval for major mergers are raising red flags for ethics lawyers concerned about the possible erosion of a firewall between the incoming White House and regulators reviewing those billion-dollar deals. Trump met this past week with the heads of German chemical company Bayer and seed and herbicide giant Monsanto, who made their case for their $57 billion merger. The deal would likely need to be approved by Trump’s choices to lead antitrust enforcement at the Justice Department. On Thursday, Trump sat down to discuss jobs with the chief executive of AT&T, which is trying to acquire Time Warner. Presidents typically keep their distance from such reviews, so as not to appear to be exerting political influence on a regulatory process intended to evaluate the impact a merger could have on competition and consumers. Trump’s private sessions suggest he may be less worried with appearing to be close to pending deals that require government approval. Part of the challenge is not knowing what was precisely said at the meetings. “We don’t know really what they were discussing, what Trump’s response was to that and to what extent that will influence the antitrust review,” said Maurice Stucke, a former attorney in the Justice Department’s antitrust division who teaches at the University of Tennessee College of Law. On Wednesday, Werner Baumann, Bayer CEO, and Hugh Grant, Monsanto CEO, talked about their merger as in the broader conversation on innovation, Monsanto said in a statement. 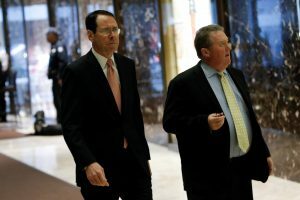 AT&T specifically denied talking about its proposed $85.4 billion merger when CEO Randall Stephenson met Thursday with Trump. The company said its conversation focused on how it could increase its U.S. investments, create jobs and make American companies more competitive. Trump’s choice for attorney general told senators this week that incoming administration would be transparent. “The antitrust policies of the United States have to be consistent and as clear as possible,” Alabama Sen. Jeff Sessions said at his confirmation hearings. “I have no hesitation, if the finding justifies it, to say that certain mergers should not occur and there will not be political influence in that process,” he said. During the campaign, Trump opposed the combination of the telecom AT&T and Time Warner, the media conglomerate that owns HBO and CNN. “It’s too much concentration of power in the hands of too few,” Trump said at the time. The meetings are part of Trump’s aggressive and unorthodox strategy for job creation, in which he openly cheers on, and sometimes jeers, individual companies. He’s shown himself willing to intervene in even relatively small corporate matters. On Thursday, Trump tweeted that people should shop at Maine retailer L.L. Bean, after The Associated Press reported that heiress Linda Bean had contributed to a pro-Trump political action committee and the company was facing calls for a boycott. Trump has praised the Japanese tech mogul Masayoshi Son, who controls the wireless carrier Sprint, for a commitment to create jobs. He has pushed Ford to scrap plans to build an auto plant in Mexico, which the company did this month in large part due to lower gasoline prices reducing demand for smaller cars. While Trump has celebrated his approach as using his negotiation skills to save American jobs, others worry the president is inappropriately intervening. Multiple lawyers told The Associated Press that the meetings with companies under antitrust review by the president-elect were unusual, though not necessarily unethical since these meetings could be considered a form of lobbying. Past presidents have waded into antitrust issues, notably Theodore Roosevelt, who sought in 1902 to break up a railroad monopoly. Trump’s meeting with Bayer and Monsanto generated concerns from the National Farmers Union, which opposes the merger on the grounds that it could harm competition and increase the price of seeds. “Our members were baffled by that meeting — that there would be time made out for it before a secretary of agriculture nominee is even presented,” said Rob Larew, senior vice president of public policy at the farmers’ trade group.